THE search for the nation's top speller is back. 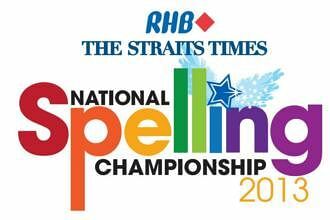 The RHB-The Straits Times National Spelling Championship - or The Big Spell - was launched yesterday, bringing back the contest that won accolades last year. It marks the second year that Malaysia's RHB Banking Group and Singapore's leading English daily are collaborating on the competition in partnership with the Ministry of Education (MOE). This year's competition includes digital spelling games that can be downloaded as an app. At the launch, held at Shaw Theatres Lido, were 300 invited guests, including teachers, pupils, organisers' representatives and partners. VIPs put their hands on an orb that lit up to the touch to mark the start. They were Singapore Press Holdings' managing editor of English and Malay Newspapers Division Han Fook Kwang and Straits Times associate editor Ivan Fernandez, RHB Bank Berhad's managing director Johari Abdul Muid and MOE's deputy director of the gifted education branch Tan Bee Geok. Then, two teams from Tampines North and Yu Neng primary schools played one digital game. The winning team from Yu Neng got four out of six words right within the 50-second limit per word, with one player, Tan Wee Teng, 12, saying "it was the monkeys that made the game tough", referring to the goalkeepers in the game which prevented letters from being scored. Afterwards, attendees were treated to a screening of The Lorax. Mrs Soo Kim Bee, MOE's senior specialist at the gifted education branch, curriculum planning and development division, said the ministry had benefited from working with corporate partners, as additional resources could accommodate more participants. To help schools prepare, MOE will hold a briefing for teachers on Tuesday, while The Straits Times weekly magazine for primary schoolers, Little Red Dot, will carry a series of spelling tips. The main event is open to only upper primary pupils nominated by a full school under the MOE. Its written preliminary round will be on March9, and "live" zonal and final rounds, on April 13 and April 27. To promote the event, Hot FM91.3 will present a word of the day and on-air spelling contests, and host spelling games through its programme Recess Express. Last year's Big Spell attracted 1,200 pupils from more than 130 primary schools, with then Anglo-Chinese School (Primary) pupil Jordan Foo winning the title. He is now a Secondary 1 student at ACS (Independent). The event also clinched two awards: a jury commendation in the World Young Reader Prize (Brand category) from the World Association of Newspapers and News Publishers, and top prize for best newspaper event in the 2012 awards from the Pacific Area Newspaper Publishers' Association. The champion will receive $5,000 and a trophy for his or her school. The first runner-up will get $3,000 and the second runner-up, $1,000.